Your choice in college bedding gives you the perfect chance to make your dorm room look beautiful. Since your Full XL bed is already in your dorm room, adding decorative dorm bedding pieces will help you upgrade the look of your college dorm room without taking up any extra space. But just because you're adding decorative extra long Full bedding doesn't mean it can't also be comfortable. College bedding can be stylish and comfortable, and our unique oversized Full XL quilts prove it! Our Dye-Free Wrinkle Quilt - All Natural White Stone Washed - Oversized Full XL has a great look to add even more style to your dorm decor. Featuring a unique textured pattern, this trendy white Full XL quilt will add a straightforward design and color to your dorm room. This soft microfiber college quilt will also feel so comfy when added to your Full XL bedding. 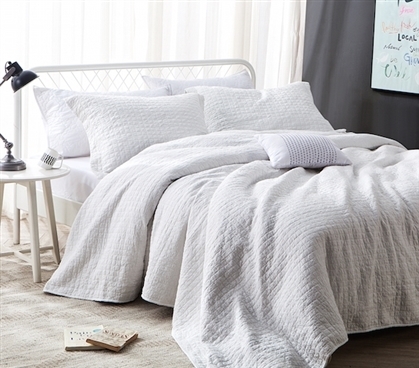 When style and comfort combine you get essential dorm supplies like this one of a kind white extra long Full quilt that you'll love having on your dorm bed.